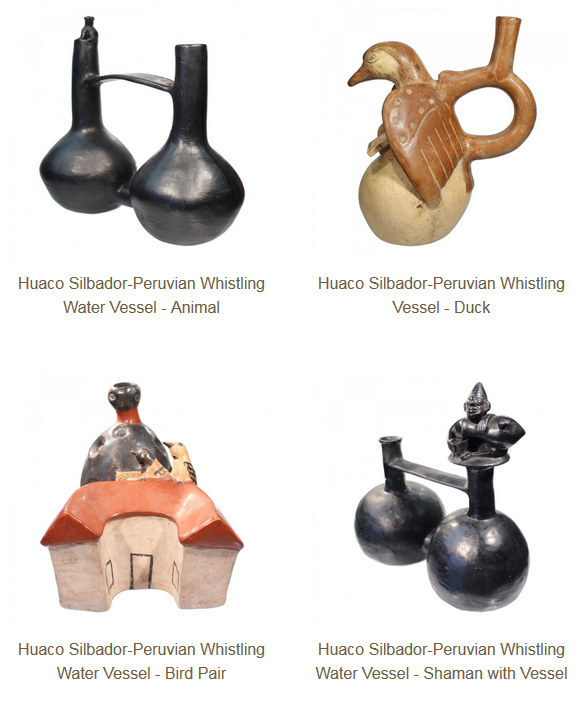 Whistling Vessels, Huacos Silbadores. 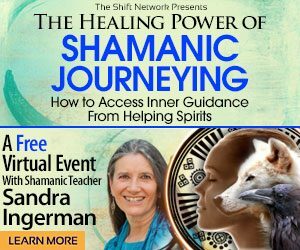 Are they ancient artifacts, magical musical instruments or ritual shamanic tools? According to some, maybe all three. These dual chambered ceramic vessels are designed to be filled with water and then either blown into or tipped back and forth by a handle fashioned between the chambers. This motion causes a whistling sound from the movement of water between the chambers and the intake of air. This Metropolitan Museum of Art post shows a short demonstration and animation. As objets d’art, these vessels are made of fired clay in black, red and other earth tones. Ana La Rosa, vesselmaker and descendent of Quechua Indians of the Peruvian Andes, uses a “pre-Incan technique of firing the pieces with leaves of mango to render a special color tone.” Typically, these pieces consist of stylized animal, human, and mythological figures, sometimes with added decorative effect like flowers, leaves, circles, swirls, and other designs and effects rendered by engraving or painting. 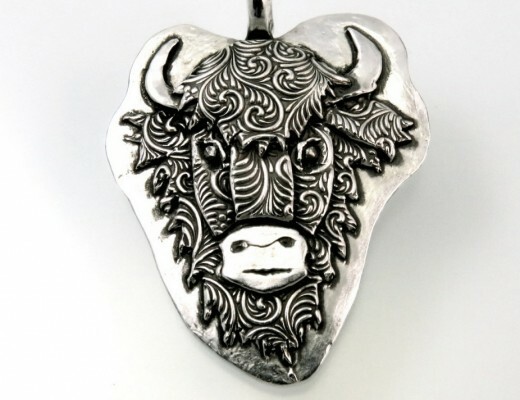 The animals represent totem or power animals, such as jaguars, or birds, such as condors, cormorants, egrets and parrots. Others include the forms of architectural structures like houses or granaries. Today’s replicas are certainly captivating and varied enough to be considered works of art and originals can be seen in many museums. 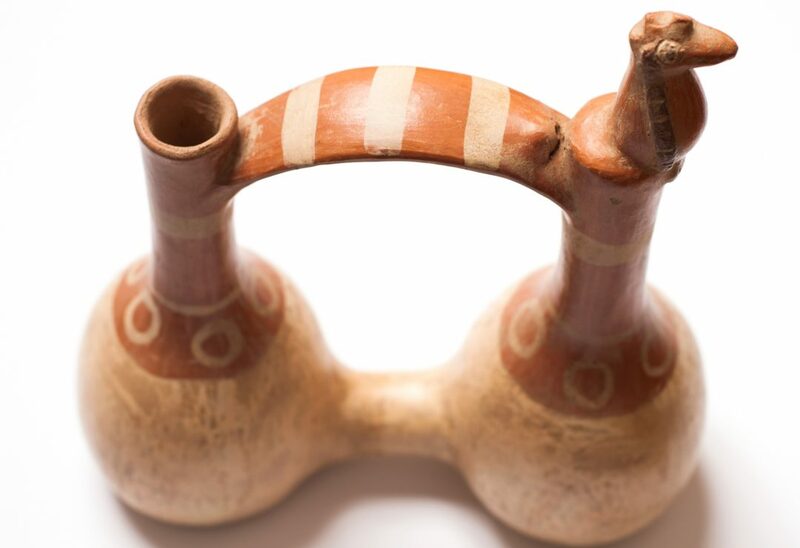 How did the pre-Hispanic makers in the Andes know how to get the sound? That remains a mystery since the long-ago creators left no written record of their techniques and these vessels were apparently neither shown to nor noted by the Spanish invaders known for making copious notes on their findings in the New World. The internal design is described by one as an “acoustic labyrinth” using specially designed air and aquaducts. Ana La Rosa admits there was no one to teach her how to fabricate the internal whistling mechanism. So she studied the inside of conch shells, or pututus, those trumpet shells used by Andean Quechua speakers in pre-Hispanic times to sound a call to summon people to a gathering or for an announcement. That the tones sounded by these vessels were selectively chosen is suggested in an article in Popular Archeology, stating that “recent archeological findings suggest[ing] that the ancients of the 3,000-year-old Andean ceremonial center at Chavín de Huántar, in the central highlands of Peru, practiced a fine art and science of manipulating sound….” Although the article was written about manipulating sound with architecture to produce desired sensory effects, it demonstrates that when it came to sound, the earlier Chavin and other early Andeans knew a thing or two. Some of the oldest whistles were dated around 500 – 300 BCE and made by the Vicus and Salinar. 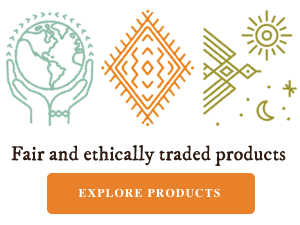 The most commonly found are Moche, Chimu and Inca in origin and date from 1000 AD until shortly after the Spanish conquest in 1532. In his book, Peruvian Shamanism, Matt Magee says, “The transformative power of certain sounds has long been understood by indigenous cultures the world over.” What exactly the vessels were used for also remains a mystery, although theories abound from which we can infer their use. Carlos Arias Segura, biologist, musician, vessel maker, and shaman, who has an interest in Peruvian cultures, believes there was a funerary ritual honoring the dead whereby a person knelt behind the vessel and leaning over it with hands on the ground on either side of it, blew through it to sound the whistle. Some say they were used to call in spirits for protection during ceremony. Wright says on his website, that “that these instruments are “capable of rapidly inducing a profound, positive, beautiful, and beneficial altered state of consciousness which lasts as long as the vessels are being blown.” This is particularly true he says when the whistles are blown in smaller groups of up to eight. 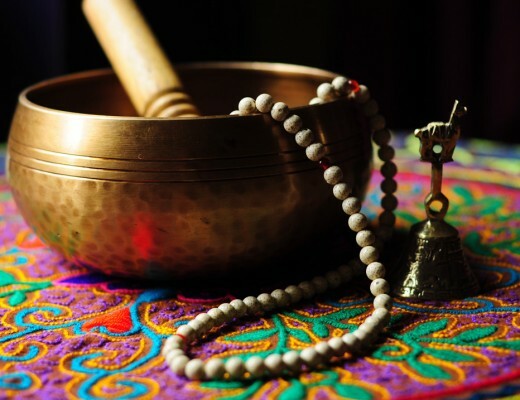 It’s not too far a stretch to believe the sound from these vessels were designed to be used by ancient shamans to ritually induce states of mind which facilitate spiritual healing and they are in fact are still being used for that purpose today. 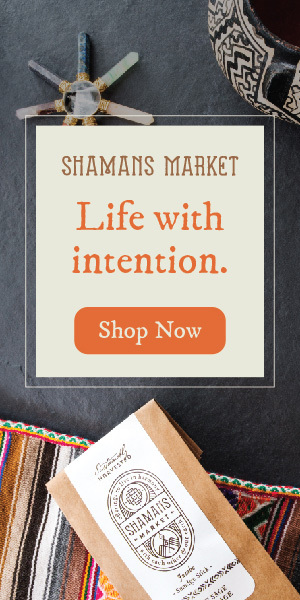 Take a look at the magical whistling vessels that Shamans Market offers and decide for yourself. 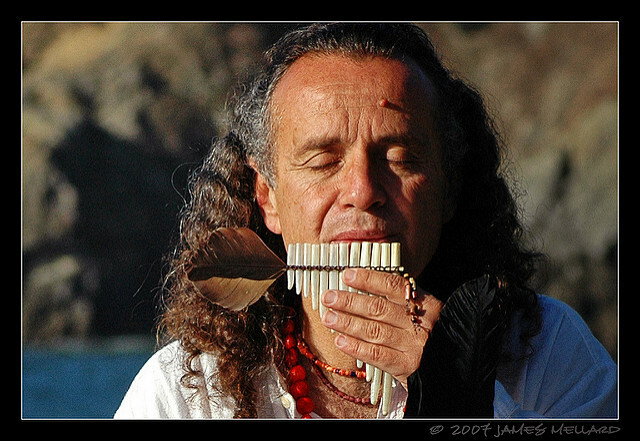 Tito LaRosa (a descendant of the Quechua Indians of the Andes) performs on numerous exotic instruments of Incan and even pre-Incan cultures. 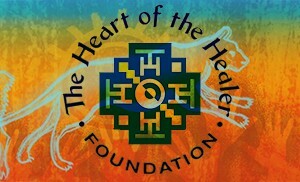 He is an Andean musician, composer, recording artist and sound healer. 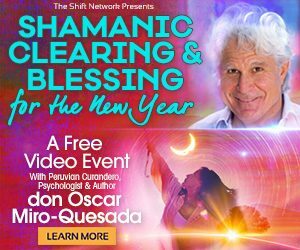 Through his concerts, flower ceremonies and music classes La Rosa helps reawaken our memories – weaving sounds into frequencies that open the heart and encourage the spirit to soar. 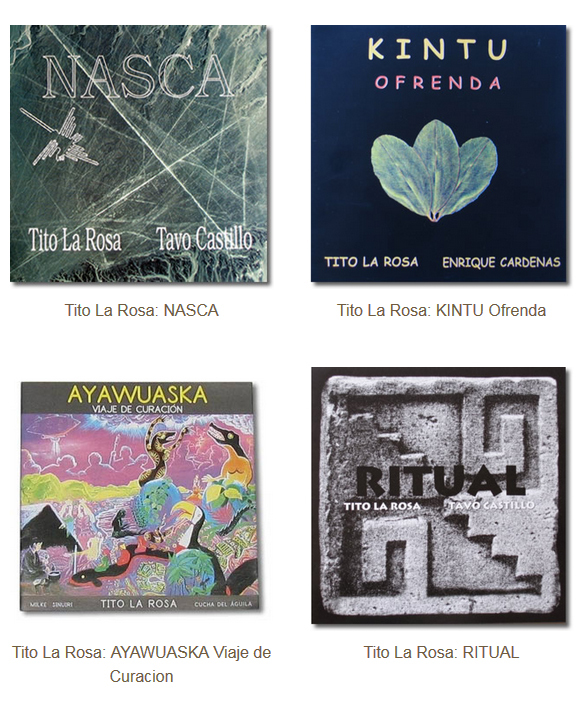 Tito has spent more than a decade recovering and preserving, studying, and intuiting the ancestral music of Peru. Tito is a Curandero de Sonido – sound healer. 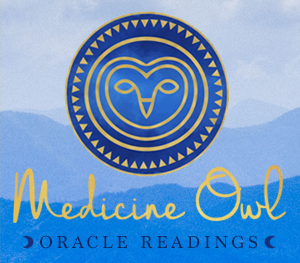 When performing ritual and ceremony for healing, he enters into parallel worlds to bring forth sound that elevates the vibration of an individual and allows for healing and balance to occur.